This episode of Inspirado Projecto, features Los Angeles Artist, Sma Litzinger and Yachtley Crew Percussionist, David Spangler (aka David Buoy). We dive deep into what inspires Sma to create her unique brand of art, in addition to Dave’s music/songwriting process! This also marks a milestone, as its the first time we’ve hosted a dog in the KCHUNG 1630am Studio! His name is Bacon Cartwright and we named the episode after him. We spin a song by Dave’s side-project, The Regals. (w/ Baba Buoy from Yachtley Crew) . We also play a Type O-Negative song request by Sma! The visual version of this show is archived on Periscope, as we like to simulcast on various live-streaming formattikas, and is available to be seen in all of its High-Definition glory right H E R E ! ! ! Rockstar Pal Stanley from Legendary Band KIZZ, surprised us in the studio unexpectedly. Here’s a wonderful example of the crazy antics he’s normally up to, on the Sunset Strip! You can check out the full audio archive in the link BELOW! If you’d like to hear the BEFORE/AFTER episodes, where we record on the PODCAST on the way to KCHUNG and on the way home from KCHUNG, you can take a gander H E R E and H E R E ! ! ! This episode of Inspirado Projecto, “Killer Bees“, is Co-Hosted by Alec Smart and Sherman Sitter, from the infamous bicycle education improv troupe, “Don’t Feed The Animals“. The first time I encountered Alec and Sherman, they were performing variety shows on Venice Beach, along with a series of animals, robots, and other creatures. One minute, a rapper named PRISM rhymed about corporations, the next minute, Sherman educated us on how to recycle our trash bin on a Windows PC. They’ve re-visited KCHUNG Studio and contributed their talents to Inspirado Projecto on many occasions. In fact, they kicked off the Inaugural Episode! Alec and Sherman The LCD Squirrel, interview Steve Brock, about his upcoming solo stageshow performance at the Los Angeles Fringe Festival, “My Calico Soul“. You can learn more about him and his other projects on his WEBSITE. Some Queen songs were played, “That’s That” segments introduced, robot radio dramas ensued, lots of unexpected improvisation evolved, and Stoney Shores from Yachtley Crew dropped by for a quick interview about tonight’s show at The Viper Room on Sunset Strip at 11pm! In addition to playing on KCHUNG 1630am Radiodials in Chinatown Los Angeles, Inspirado Projecto streamed visually on Periscope, which can be watched HERE! ALSO!!!! You can hear the Inspirado Projecto PODCAST episode “KCHUNG Radio Journey,” of what CEC encountered on his way TO the radio station and on the way home from it, saved in Official Archive Formattika, H E R E ! In the KCHUNG 1630am Radio Studio, we welcome Mike Schlie and Brian D’vil, a unique combination of creators indeed. Mike and I met on the set of “Black Pumpkin”, while we worked as Set Decorators. Through a week and a half of collaborating with him, I’ve learned he is an Engineer, Life Coach, Author, Alchemist, Teacher, Screenwriter, Inventor, Artist, and Mayor of San Pedro, who investigated health and how nutrition affects the organs and mentality of humans. He was led down a rabbithole in finding alternative methods to eliminate our top diseases and ailments with natural cures. His book, “The Infinity Diet”, is on AMAZON contains exciting and healthy food discoveries! Brian and I met when I attended one of his Legendary Eclectic Egress Fests a few years ago. He wears many disguises, some of which are: DJ, Event Organizer, Sound Designer, Music Video Maker, Noise Musician, Album Designer, and Professor of Los Angeles Art Happenings. His upcoming event at SunSpace, Noisy Industries, is sure to knock your socks off, 6-2-2018! This episode, “Noise Nutrition”, we present some Fun Facts by Henry D. Horse, played a very very rare Oingo Boingo song, presented a Brian D’vil classic, talked about Yachtley Crew news, spun one of Mike’s unique requests by B52’s, and… invented a brand new music genre which will soon sweep the nation! We also broadcasted LIVE on Periscope which can be VIEWED HERE! It was an original experience, to be able to collaborate with these two artistic explorers of knowledge! They shall be back in the studio again before we know it! 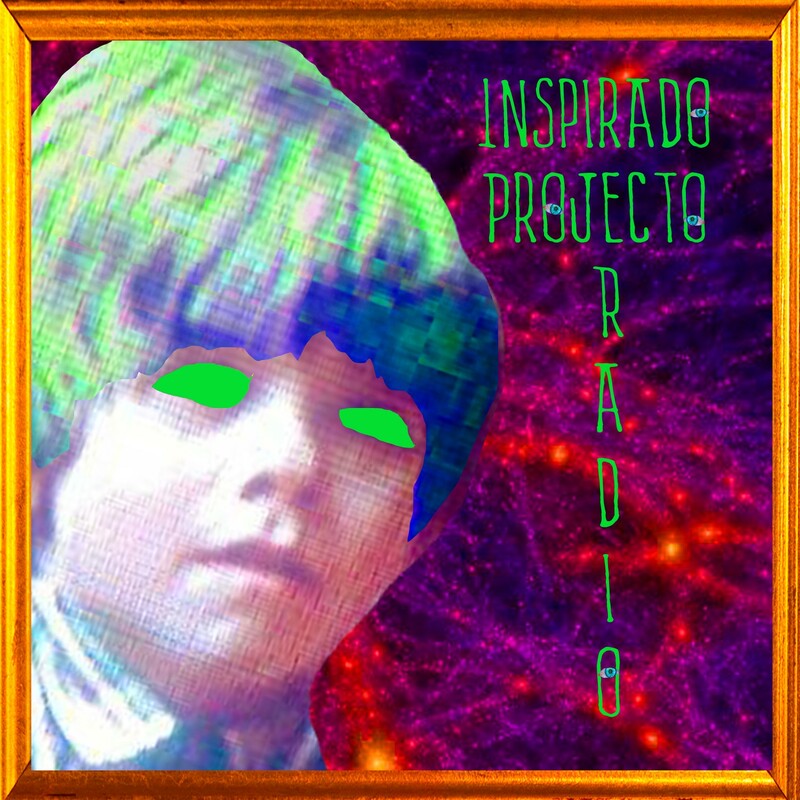 Thank you to Captain Nicholas for piloting the Inspirado Projecto Spaceship and capturing the actual audio archive of our KCHUNG 1630am Inspirado Projecto Radio Show!!! CLICK the PLAY button BELOW, to hear it! Orly Rodriguez joins us via Skype from Florida, currently cobbling together a virtual reality experience based in the world and characters of Twin Peaks, called “The Archivist.” Orly is additionally making another VR game called, “The Question” (one of the characters, “The Guide”, is voiced by yours truly), which is more cosmic-oriented and Twilight Zone-inspired. You can find the Official Facebook page HERE! Another gent Skyping in, is Standup Comedian (and longtime improv-collaborator since High School), Jason McNeil, from the Chicagoland area. McNeil’s performances are not limited to stages within traditional venues. He plays on all size stages such as: living rooms, basements, meeting rooms, sidewalks, and other unexpected locations. “Hilaritygram”, his door-to-door comedy business, is perfect for any kind of celebration and can be ordered all over the Chi-town regions! He also voices a couple characters for “The Archivist”. One of those, is the narrator featured in the extraordinary trailer below! These are some screenshots of familiar locations/characters from the extraordinary world of “The Archivist”. Also included is a photo of when Jason and I appeared in our first play together in High School, “Golden Boy”. The pics of the bald character in front of the door/purple backgrounds, is “The Guide” from Orly’s other VR, “The Question”. In this episode, we also featured several unique selections from Brian D’vil (one of our original co-hosts of Inspirado Projecto and Curiosa Obscura on KCHUNG 1630am), Worldland (another one of P.Q. Ribber‘s many side projects), Bukket (Joe McGaha‘s band), Funfacts by Henry D. Horse, and a selection from Man Behind The Machine! If you’d like to watch this episode unfold in a video version of the broadcast, you can check out our archived Periscope version HERE!. The audio version that played on KCHUNG 5-7-2018, can be HEARD HERE! Did you know Inspirado Projecto Podcast can now be subscribed to on iTunes? Its also available through many various podcast apps AND now its feeding through Mixcloud! You are invited to send your audioscapes to: inspiradoprojecto (at) gmail for inclusion on both the radio show AND podcast! This episode of Inspirado Projecto is concocted while flying solo in the KCHUNG Studio. We played an experimental sound collage by Nitroglycerine Pep Club, Rodriguez, Fun Facts by Henry D. Horse, an imperative public service announcement by PSY-CORP, a folk song by Matt Steady, a wonderfully informative bicycle education soundbite from Alec Smart from Don’t Feed the Animals, an extraordinary time travel experience by George W. Johnson, a series of riffs/ideas recorded into a phone, a unique soundscape by LauraP5, cosmic-based music by Jason Karr, the latest gossip from the Celebrity Afterlife Medium about all of your favourite dead celebrities, one of my Brother Josh’s favourite songs of all time, a song written and performed by Stew Strauss (Woodsman from Twin Peaks), a surprising song from the new Ash Vs Evil Dead tv show, a special rendition of popular favourite by Molly and Spiker, a futuristic dance-o-rama classic by Damas, a super multi-funktacular jazz-sterpiece by Swells, and a fun Americana song by Ken4Strings. Also, listen for a very special improvised version of “Sweet Home Chicago” recorded at soundcheck before the Hollywood Cares Celebrity Poker Tournament at the Avalon with Peter Beckett (“Baby Come Back”) on guitar, Elliot Lurie (“Brandy, You’re a Fine Girl”) on guitar. Thomas Gardner (from Yachtley Crew) on guitar, Paul Pate (from Yachtley Crew) on saxophone, and me (from Yachtley Crew) on vocals. Did you know Inspirado Projecto is now also a podcast available for subscription on iTunes? It happens more frequently with more sloppiness. We also played simultaneously on Periscope in a visual format. Below you can click on the audio archive from KCHUNG 1630am, to hear it on Mixcloud. On this 3-5-2018 episode of Inspirado Projecto, we collaborated with some wonderful guests in the KCHUNG 1630am Studio! Songwriting duo Blythe Baines & Carter Soso played samples from their upcoming “Games” EP on Priority Records. Woodsman Stewart Strauss from “Twin Peaks: The Return”, talked about working with David Lynch and surprised us with one of his own songs! Everyone revealed their creation processes and what most inspires them to give birth to such artistic gifts. Its been awhile since “Celebrity Afterlife Report Podcast” was played on Inspirado Projecto, so get ready for it at the top of the hour! Henry D. Horse blessed us with another “Fun Fact”, a Queen song snuck its way onto the air, and lots of talk about synchronicities were revealed! We broadcasted LIVE visually through Periscope if you’d like to see it HERE! Aaaaand, if you’d like to hear the audio archive, please CLICK HERE!!! Jeff Finn, documentary filmmaker of “Strange Septembers” and “Before The End” and fellow PEAKer, also joined us in the KCHUNG Studio to geek out with these crazy cats about their experiences working with David Lynch. Music from the soundtrack of Twin Peaks: The Return, an original song by Christian Calloway, some news reporting by Stewart, and “Fun Facts” from Henry D. Horse, were also played. Since we geeked out so much, unfortunately the latest Celebrity Afterlife Report Podcast was not played on this show. We talked about Rob’s background as an Abraham Lincoln impersonator, in addition to Christian’s charity. We also discovered that Christian knew Stewart long before they were both cast as The Woodsmen for Twin Peaks: The Return! Rob was a sport and let me place my Grandpa’s old hat on his head to re-create that amazing scene in Twin Peaks: The Return where he crushed the radio dj’s skull with his bare hands! The whole shebang was broadcasted LIVE on Periscope which can be seen HERE. The audio archive is saved on the KCHUNG website for listening pleasure HERE! Thank you to David Lynch for inventing Twin Peaks and to Jeff, Rob and Christian for coming into the studios to share their wonderful stories! Inspirado Projecto plays our 1st episode of 2018, on the very 1st day OF 2018! Dori joins us in the KCHUNG studio, a day after celebrating New Year’s Eve at Twin Peaks’ One Eyed Jacks in Hollywood. Many various Twin Peaks related soundtrack songs are played during the broadcast. The Yacht Rock Time Travel Dream Cruises with Yachtley Crew at the Bombay Bar & Grill and The Viper Room are discussed. Guy Latham makes a unique request. Fun Facts by Henry D. Horse are distributed. The brand new Celebrity Afterlife Report is played. And other unique surprises emerge. Once the audio archive becomes available on KCHUNGradio.org, the link shall be placed on this posting. In the meantime, you can check out the live visual Periscope broadcast archive HERE! This episode we have special guests Sandy and Clutch from D’oh T-Shirts in the KCHUNG Studios! In addition to digging into what inspires them to create these vintage-y works of art, we explore the avenues in which they intend their company to evolve. Some of the interesting subjects during the show include: Plum Island, CBD, the recent news of the Pentagon’s investigations of UFOs, Tom DeLonge’s “To The Stars Academy”, Mario Lopez’s amazing Holiday party with Yachtley Crew, my recent interview with SoFilm Magazine about Andy Kaufman faking his death, the recreation of Twin Peaks’ “Roadhouse” (aka “Bang Bang Bar”) in Los Angeles, and the crazy online circus known as Kaufman Carnival! We also played fun audio by Pete Seeger, Lovey Forbes, Nitroglycerine Pep Club, and of course Fun Facts with Henry D. Horse! Check out D’oh T-Shirts sometime! They’re made with quality materials! If you’d like to listen to the show, you can CLICK THE ARCHIVE HERE! We also broadcasted on Periscope, the link of which can be FOUND HERE! On this episode of Inspirado Projecto, CEC interviews fellow Kaufmaniacs, @Ken4Strings and @GuyLatham about the recent phenomenon known as Kaufman Carnival sprouting up on Twitter and Periscope via a dozen or so circus-themed characters. Its a mystery as to whether Stephen Maddox is behind these multiple personas, if he’s recruited some of his old pals from Puzzlementary Productions to help out, or if Andy Kaufman is controlling the switches with Maddox under his employment. We also play the latest Celebrity Afterlife Report by everyone’s favourite Celebrity Medium, reveal a couple of intriguing Fun Facts by our resident detective Henry D. Horse, featured melodious wonderments by both Guy and Ken, and unveil a series of synchronicities that I encountered at a Yachtley Crew show. We also pulled out an old classic by The Amboy Dukes, a very unique song by Orion/Elvis, and recount a very spiritual moment in time with an Apache Native in a bar. Inspirado Projecto frequently makes friends with folks on the subway trains, buses, and through various social networks. Sometimes we get a surprise in our emailbox: inspiradoprojecto@gmail.com. It could be spoken word, music, a sound collage, anything that is audio. This time, it was from an EDM artist named Akira The Don, and another fun jam band called The Merry Jaynz. We happily played their music on this broadcast as well, and look forward to playing more from other folks in the future! This entire show was Skyped from the 1630am KCHUNG Radio whilst I was simultaneously broadcasting through Periscope. Unfortunately, I Station Manage this episode and forget to actually record the adio! However, the good news is, the full length PERISCOPE VIDEO ARCHIVE IS HERE! Another fun perspective is through this quick Instagram video footage. Thank you to everyone who contributes to the show on the 1st and 3rd Mundees of each month! Its been so much fun to showcase your talents for the Youniverse to experience. Also, here is a very special treat that was edited by Kaufman Carnival!